Stockholm, September 27, 2013. The Intergovernmental Panel on Climate Change (IPCC) released a new assessment that concludes, the human influence on the climate system is clear and that this is evident in most regions of the globe. “It is extremely likely that human influence has been the dominant cause of the observed warming since the mid-20th century. The evidence for this has grown, thanks to more and better observations, an improved understanding of the climate system response and improved climate models, IPCC says in a press release. Arctic sea ice was at a satellite-record low for the second month in a row. The first three weeks of February saw little ice growth, but extent rose during the last week of the month. Arctic sea ice typically reaches its maximum extent for the year in mid to late March. Arctic sea ice extent for February averaged 14.22 million square kilometers, the lowest February extent in the satellite record. It is 1.16 million square kilometers below the 1981 to 2010 long-term average of 15.4 million square kilometers. 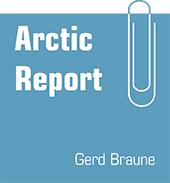 It is my pleasure to welcome you to www.arctic-report.net. As a Canada-based journalist working as a correspondent for newspapers in Germany, Austria, Luxembourg and Switzerland, I have followed and reported on developments in the Arctic regions for many years. I would like to invite you to follow my work via this site. The website’s objective, however, is not just to present my own work. Rather, the following pages provide numerous documents that are relevant to arctic-related issues, as well as links to news sources, research institutions, research papers, government departments and agencies, international bodies, as well as non-governmental organizations and the organizations of the Indigenous Peoples of the North. My aim is to provide background information, while assisting in the search for further information. I would also like to invite you to use www.arctic-report.net as a source for articles and photos for use in publications. I hope that you will find this site interesting and useful, and that you will perhaps share this address with others who have an interest in arctic issues. 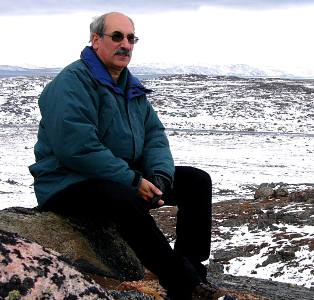 I welcome your feedback, and am grateful for advice on additional information that would enrich www.arctic-report.net. I appreciate your interest in my work, and look forward to hearing from you!